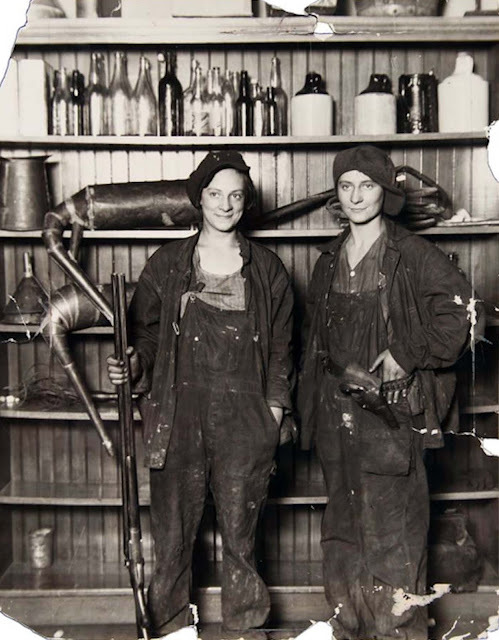 Women bootleggers enjoyed many advantages over men. Many states had laws specifically prohibiting women from being searched. Sometimes they would hide flasks, even cases, on their persons and taunt male police officers. “A painted-up doll was sitting in a corner… She had her arms folded and at our command she stood up. But then came the rub. She laughed at us… then defiantly declared to bring suit against anyone who touched her”, an unnamed Ohio “Dry Agent” told the Hamilton Evening Journal in 1924. The alcohol smuggling syndicates took advantage of these legal loopholes, recruiting women into their ranks. Even if the gangs didn’t hire women bootleggers, they hired them for ride along to reduce searches and robberies. “No self-respecting federal agent likes to hold up an automobile containing women”, according to The Boston Daily Globe. This had become such a problem for law enforcement officials that the government feared women bootleggers outnumbered men five to one. “On the Canadian, Mexican and Florida borders, inspectors are constantly on the lookout for women bootleggers who try to smuggle liquor into the States. Their detection and arrest is far more difficult than that of male lawbreakers”, said Miss Georgia Hopley, the first female Revenue agent. Juries were also reluctant to convict mothers and grandmothers of bootlegging. Thus, they were much less likely to suffer from their illegal activities. In 1925, a woman in Milwaukee admitted earning $30,000 a year bootlegging. That’s over $400,000 in today’s dollars. She was fined only $200 and sentence to a month in jail. A 22-year-old bootlegger in Denver, Esther Matson, was sentenced to attend church every Sunday for two years. The President pardoned a Michigan woman bootlegger. Similarly, the governor of Ohio reduced a woman bootlegger’s sentence to only five days. I bet a woman bootleggers in Oklahoma got life sentences.